Cracking open a can of peaches and slurping down the syrupy, sticky sweet juice before eating the peaches inside always made me feel like I was getting away with something. How could something so tasty also be good for you? Surely this canned nectar of the gods isn’t as healthy as biting into a juicy fresh peach. But a new study says actually, canned peaches are just as nutritious as the fresh ones. 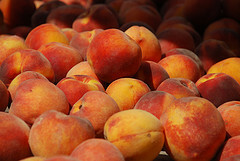 Not only do peaches that come from a can and were put there by a man in a factory downtown (a process the Presidents of The United States Of America so aptly captured in song) come loaded with as many nutrients as their fresh counterparts, a study published in the Journal of the Science of Food and Agriculture says sometimes the canned kind are even better for you. NPR looks into the study and points out the finding that there’s almost four times as much vitamin C in canned peaches than fresh, and a lot more folate as well. Levels of vitamin E were comparable in both kinds. There’s a similar effect in foods like tomato sauce, which has higher levels of lycopene — a potential cancer-prevention agent — than fresh tomatoes. It’s worth noting that the California cling peach industry, which is the kind of peach in the canned products, partially funded the study. To that point, the lead author of the research says the peach growers had no say in how the tests were carried out. “The experimental design was our own,” he explained, adding that the researchers and the industry agreed that no matter what the results were, researchers would publish what they found. dude where are my veggies?